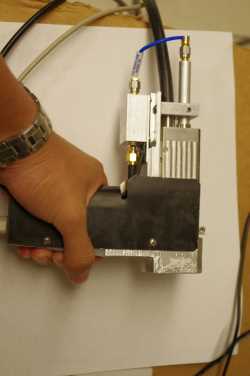 A photograph of the handheld probe. The motor, translation stage, ultrasonic transducer, and optical fibers are all incorporated in this handheld probe for easy operation. Image courtesy of Yong Zhou. A new hand-held device that uses lasers and sound waves may change the way doctors treat and diagnose melanoma, according to a team of researchers from Washington University in St. Louis. The instrument, described in a paper published today in The Optical Society’s (OSA) journal Optics Letters, is the first that can be used directly on a patient and accurately measure how deep a melanoma tumor extends into the skin, providing valuable information for treatment, diagnosis or prognosis. Melanoma is the fifth most common cancer type in the United States, and incidence rates are rising faster than those of any other cancer. It’s also the deadliest form of skin cancer, causing more than 75 percent of skin-cancer deaths. The thicker the melanoma tumor, the more likely it will spread and the deadlier it becomes, says dermatologist Lynn Cornelius, one of the study’s coauthors. Being able to measure the depth of the tumor in vivo enables doctors to determine prognoses more accurately—potentially at the time of initial evaluation—and plan treatments and surgeries accordingly. The problem is that current methods can’t directly measure a patient’s tumor very well. Because skin scatters light, high-resolution optical techniques don’t reach deep enough. “None are really sufficient to provide the two to four millimeter penetration that’s at least required for melanoma diagnosis, prognosis or surgical planning,” says engineer Lihong Wang, another coauthor on the Optics Letters paper. Researchers have tried other methods, but they aren’t much better. High-frequency ultrasound doesn’t have enough image contrast, and magnetic resonance imaging and positron emission tomography have insufficient resolution and require expensive and bulky instruments. “Any type of tissue diagnosis at this point in time requires taking tissue out of the person and processing it and looking at it under the microscope,” Cornelius says. But because taking a biopsy often only involves the removal of a part of a tumor—when it’s in a cosmetically sensitive area, for instance—provisional measurements of the tumor depth are not always reliable. If, at the time of excision, the surgeon finds that the tumor goes deeper than initially thought, the patient may need yet another surgery. Recently, researchers including Wang have applied an approach called photoacoustic microscopy, which can accurately measure melanoma tumors directly on a patient’s skin—thus allowing doctors to avoid uncertainty in some circumstances. The technique relies on the photoacoustic effect, in which light is converted into vibrations. In the case of the new device, a laser beam shines into the skin at the site of a tumor. Melanin, the skin pigment that’s also in tumors, absorbs the light, whose energy is transferred into high-frequency acoustic waves. Unlike light, acoustic waves don’t scatter as much when traveling through skin. Tumor cells will produce more melanin than the surrounding healthy skin cells, and as a result, the acoustic waves can be used to map the entire tumor with high resolution. The device has a detector that can then turn the acoustic signal into a three-dimensional image on a screen. April 15, 2019 - Mechanism of resistance to BRAF inhibitors in melanoma identified: A conserved stress response mechanism leads to BRAF inhibitor resistance through AP-1 activation Science DailyMelanoma is one of the most aggressive types of skin cancer, but recent advances in targeted therapies have improved the prognosis for many patients. April 15, 2019 - Researchers identify mechanism of resistance to BRAF inhibitors in melanoma Medical XpressMelanoma is one of the most aggressive types of skin cancer, but recent advances in targeted therapies have improved the prognosis for many patients. April 13, 2019 - Skin cancer cases on the rise and it's not just melanoma you need to keep an eye on KGO-TVIf you love the sun, watch out. The new warning from doctors and what you need to keep an eye on. Hint: it's not just melanoma you need to worry about.